The technical support of Haver & Boecker, expert in packing, palletizing and loading, got a new structure in September 2015. Intended is to bundle the competencies and to increase the efficiencies of support services in order to meet the customer needs even faster and better. The newly founded department Haver Service is based on four columns: Spare Parts, Commissioning, Support and Assistance. “Every of our customers is supposed to feel exemplary served; Service cannot be an empty word.” Alfons-Lütke-Cosmann, Head of Haver Service, points out. The Commissioning experts organize assemblies and commissioning of machine and plants as well as complex reconstruction and calibration. It is the target to increase the efficiency with commissioning and a future-orientated plan of actions. The sector Spare Parts contains the pro- and reactive selling of spare parts. For this purpose belongs the planned implementation of an E-Commerce solution as well. 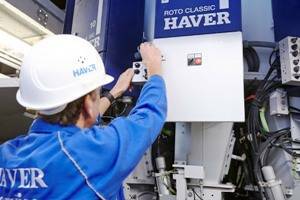 In the sector Assistance the Haver experts are at the side of the customer for unplanned machine failures and acute technical difficulties. To this, they provide a free of charge 24/7 hotline and a remote service and organize, depending on requirements, current site service calls. Among Support are audits, maintenance, standard conversions, customer training and planned service appearances. Through these measures, the customer is able to increase his machine availability and raise his productivity. Australia Pty will be in touch as soon as possible.